Introduction: Situated on the eastern bank of the Cape Fear River, some 30 miles north of its confluence with the Atlantic, North Carolina's principal seaport could not have been better suited for running the blockade. Wilmington was a city safely out of range of any Federal bombardment from the ocean, and its close proximity to the major transshipment points for incoming European goods was ideal. Fought mostly outside the city, the Battle of Wilmington, North Carolina, was fought February 12–22, 1865, during the American Civil War. The Union victory in January at the Second Battle of Fort Fisher meant that Wilmington could no longer be used by the Confederacy as a port. 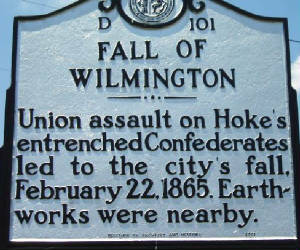 It fell to Union troops after they overcame Confederate defenses along the Cape Fear River south of the city. In a calculated withdrawal from the port city, Gen. Braxton Bragg burned stores of tobacco and cotton, among other supplies and equipment, to prevent the Union from seizing them. Summary: With the capitulation of Fort Fisher to Maj. Gen. Alfred Terry’s and Rear Adm. David Porter’s combined operation on January 15, Wilmington’s days were numbered. About 6,600 Confederate troops under Maj. Gen. Robert Hoke held Fort Anderson and a line of works that prevented the Federals from advancing up the Cape Fear River. Early February, the XXIII Corps arrived at Fort Fisher, and Maj. Gen. John Schofield took command of the Union forces. Schofield now began a series of maneuvers to force the Confederates to abandon their defenses. On February 16, Jacob Cox’s division ferried across the river to confront Fort Anderson, while Porter’s gunboats bombarded the fort. On February 17-18, Ames’s division conducted a wide flanking march to get in the fort’s rear. Seeing the trap ready to close, the Confederates evacuated Fort Anderson during the night of the 18th-19th, withdrawing to Town Creek to form a new defensive line. The next day, this line collapsed to increasing Federal pressures. During the night of February 21-22, Gen. Braxton Bragg ordered the evacuation of Wilmington, burning cotton, tobacco, and government stores. Fort Anderson, not to be confused with Fort Anderson (aka Deep Gully) in Craven County, was a large earthen fort on the western bank of the Cape Fear River Defense System that protected the port of Wilmington. After the Federals unleashed a spectacular naval bombardment followed by an amphibious assault, subduing Fort Fisher, Fort Anderson was bombarded and seized by Union troops during their march to capture Wilmington, the largest city in the state. Its beautifully preserved coastal defenses had been built atop the ruins of colonial Brunswick Town. Background: After the fall of Fort Fisher, the port city of Wilmington was closed to blockade runners, but most importantly the Confederates had no remaining major ports along the Atlantic seaboard. While Confederate forces evacuated the other defensive works near the mouth of the Cape Fear River, they were forced to disable and abandon the heavy artillery since they lacked the means to move the pieces upriver. Gen. Braxton Bragg commanded the forces at Wilmington, which consisted of Gen. Robert F. Hoke's division from the Army of Northern Virginia, some artillery soldiers and men serving as home guard. Hoke commanded three of his brigades on the east side of the Cape Fear River, along Sugar Loaf north of Fort Fisher, and Hoke's fourth brigade occupied Fort Anderson on the west side of the river. Bragg remained in Wilmington in order to remove a stockpile of government stores and also to prevent Union forces on the coast from reinforcing Maj. Gen. William T. Sherman's army. Lt. Gen. U.S. Grant hoped to use Wilmington as a base for an assault on Goldsboro because its rail lines from the coast to Goldsboro could be used to resupply Sherman's forces, which were now moving north through the Carolinas. In February 1865, the Union XXIII Corps arrived to reinforce the Fort Fisher Expeditionary Corps, commanded by Maj. Gen. Alfred H. Terry. Maj. Gen. John M. Schofield assumed command of the combined force and started moving against the city in mid-February. (Right) Map of the Civil War battlefields in North Carolina. 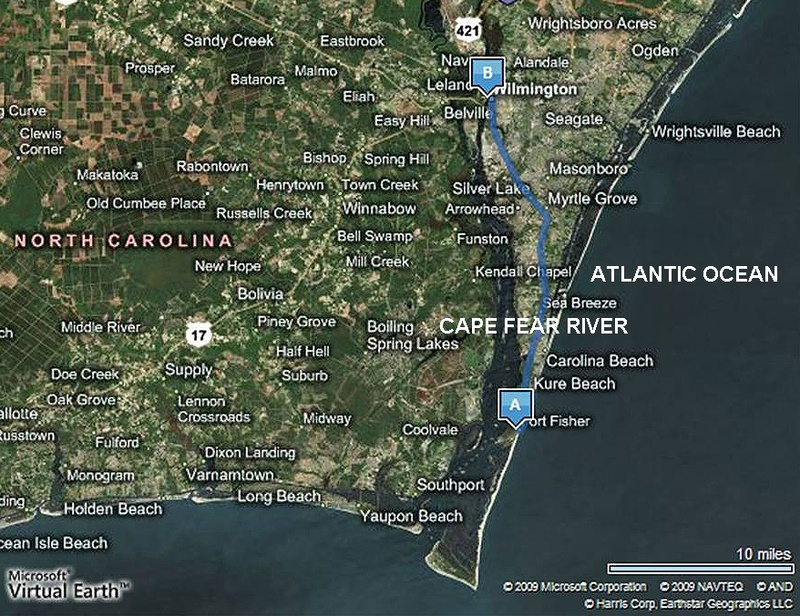 Battle: The Battle of Wilmington consisted of three smaller engagements along the Cape Fear River. A Confederate division under Major General Robert Hoke occupied the Sugar Loaf Line north of Fort Fisher. On February 11, Schofield attacked Hoke's Sugar Loaf Line with Alfred Terry's corps; the engagement started in the morning with a bombardment by Union gunboats along the Atlantic side of the fortifications. A half hour later, Terry started his advance but his left wing was hindered by a swamp located along the river. By late afternoon, Schofield and Terry had overrun the Confederate skirmish line but then concluded that the main Confederate works were too strong to be captured by frontal assault; Schofield decided that he had to capture Wilmington from the western side of the river. Next Major General Jacob D. Cox's 3rd Division, XXIII Corps was ferried to the west bank of the Cape Fear River to deal with Fort Anderson, the main fortress guarding Wilmington. Rear Admiral David D. Porter's gunboats sailed up the river and shelled Fort Anderson silencing all twelve guns. Under the direction of Lt. Commander William B. Cushing the Federal Navy constructed a Quaker (or fake) monitor to trick the Rebels into detonating their water mines to make way for Porter's gunboats. Both Cushing and Porter where highly pleased with the success of the ploy, however later Confederate reports claimed the garrison was expecting a dummy boat and were prepared. Meanwhile Cox, supported by General Adelbert Ames' division, advanced up the west bank towards the fort. Cox sent the brigades of Colonel Thomas J. Henderson and Colonel Orlando Moore against the garrison itself while Col. John S. Casement and Col. Oscar Sterhl marched through the swamps around the Confederate flank. Casement and Sterhl encountered Confederate cavalry and pushed it back after a short fight. The fort's commander, General Johnson Hagood sensed the trap and received confirmation from Gen. Hoke to pull back to a defensive line along Town Creek to the north. Just as Hagood's troops began their retreat, Henderson's brigade attacked thus taking the fort rather easily along with a few prisoners. Cox pursued Hagood from Fort Anderson, and on February 19 caught up to the Town Creek Line while Hoke's division retreated to a position three miles south of Wilmington, across the river from Hagood's force. Terry followed Hoke cautiously, worried about being surprised by an ambush or by a flank attack from his right. By this time Hoke actually outnumbered Terry as Ames' division was now on the west bank with Cox. Therefore Ames was ferried back across again to Terry and Porter's fleet started clearing the river of torpedoes. Terry restarted his advance the next day, encountering Hoke's new lines in the afternoon. Once he was convinced that Hoke planned to remain where he was, Terry ordered the Union troops to start building entrenchments while Union gunboats tested the Confederate batteries along the river bank, just west of Hoke's division. Hagood had burned the only bridge across Town Creek to slow down Cox and entrenched on the north side of the river. Cox was eager to attempt his encircling plan that, due to Hagood's retreat at Fort Anderson, the Federals had been unable to complete. The creek was not fordable, so on February 20 Cox's troops found a single flat-bottom boat in the river and used it to ferry three brigades across the creek while the fourth brigade skirmished with Hagood as a diversion. Hagood discovered the flanking movement and decided, since his position was now untenable, to retreat back to Wilmington; he left two regiments to cover his retreat. The Federals then waded through the swamp and attacked the Confederate flank, routing the two regiments, and taking 375 prisoners along with two pieces of artillery. The next day Cox rebuilt the destroyed bridge and Schofield's artillery crossed and along with Porter's gunboats both were within range of the city itself. General Bragg saw the hopelessness of the situation and ordered the city abandoned. On February 21, Cox's division continued its march toward the city but was delayed by the destroyed bridges across the Brunswick River and by Confederate cavalry, while Hoke's division continued to hold off Terry's command. 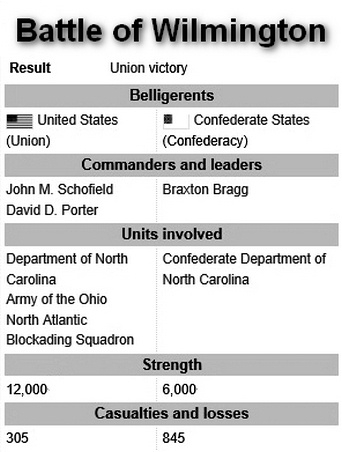 Bragg used the 21st to evacuate Union prisoners located there, while evacuating anything of military value; he also ordered bales of cotton and tobacco burned so that they would not fall into Union hands, along with storehouses, foundries, shipyards, and ships. Bragg retreated with his forces at 1 a.m. on the 22nd; Cox's corps entered the city after 8 a.m., with Terry's forces entering an hour later. Fort Fisher (A) to Wilmington (B) Route. Two strategic locations during the Civil War. Aftermath: The Battle of Wilmington closed the last major port of the Confederate States on the Atlantic coast. Wilmington had served as a major port for blockade-runners, carrying tobacco, cotton, and other goods to places such as Great Britain, the Bahamas, and Bermuda; much of the supplies for the Army of Northern Virginia came through Wilmington. Now with the port closed, the Union blockade was complete; the Confederates were unable to find another port along the Atlantic seaboard to replace Wilmington. Bragg came under severe criticism from the press for the Confederate defeat in the Wilmington Campaign. Several members of the Confederate Congress also directed criticism towards Confederate President Jefferson Davis and called for his resignation. Bragg's forces from Wilmington retreated towards Goldsboro, North Carolina, where it united with other Confederate forces commanded by General Joseph E. Johnston. The capture of Wilmington gave Sherman's forces a base of supply and a supply route to the sea. Schofield was forced to spend some time repairing the damage caused by the Confederates to the rail lines near the city; he was also forced to use supplies earmarked for Sherman to help paroled prisoners sent to Wilmington and the civilians still living in the city. Schofield's forces were reorganized into the Army of the Ohio and from Wilmington he marched inland to join with Sherman's forces near Fayetteville. Analysis: After the fall of Mobile, Alabama, in August 1864, Wilmington, North Carolina, became the last major Confederate seaport open to blockade-running traffic. Throughout the war, Wilmington had thrived as a hub for Southern maritime trade. Despite a vigilant Union naval blockade, profit-minded traders successfully smuggled foreign goods and munitions of war into Wilmington. The sleek, shallow-draft steamers unloaded their wares at the docks in exchange for cotton, naval stores, and lumber. From Wilmington, military provisions were then funneled straight to Virginia (heart of the war’s Eastern Theatre) via the Wilmington & Weldon Railroad. In the final year of the conflict, as the noose tightened on the dying Confederacy, Wilmington anchored a tenuous lifeline for Confederate Gen. Robert E. Lee’s Army of Northern Virginia. By late summer 1864, Union policy makers began to focus their attention on the “city by the sea.” In assessing Wilmington’s illicit trade and the link to Lee’s army, U.S. navy Secretary Gideon Welles deemed Wilmington “more important, practically” than the capture of the Confederate capital at Richmond. Welles pushed for a combined army-navy strike to topple Wilmington and the vast network of river defenses guarding her estuary. 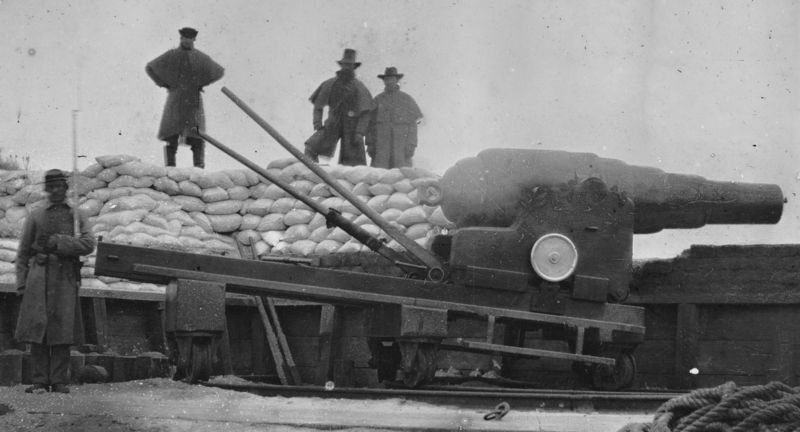 The key to these defenses was Fort Fisher—the largest earthen fort in the Confederacy. Commanded by Col. William Lamb, the massive 47-gun bastion protected New Inlet at the mouth of the Cape Fear River, twenty miles below the docks at Wilmington. Fisher communicated with incoming blockade-runners through a system of signal lights, and her guns dueled with Union blockaders on a regular basis. Secretary Welles understood that Fisher had to be captured in order to choke Lee’s supply line. President Abraham Lincoln and Union general-in-chief Ulysses S. Grant agreed. The fort's fall sealed Wilmington's doom. More than a military campaign study, Fort Anderson: Battle for Wilmington examines the history of the fort's location from its halcyon days as North Carolina's leading colonial port of Brunswick to its beginnings as a Confederate fortification in 1862 and its fall to Union forces three years later. The fort also had several eerie connections to President Abraham Lincoln's assassination. Today the fort is part of the tranquil Brunswick Town State Historic Site. Fort Anderson: Battle for Wilmington is liberally illustrated with maps and illustrations, including many previously unpublished soldiers' images. It also contains an order of battle, endnotes, bibliography and index. Sources: North Carolina Department of Cultural Resources; National Park Service; Library of Congress; Official Records of the Union and Confederate Navies; Official Records of the Union and Confederate Armies; Chaitin, Peter M., ed. (1984). The Coastal War: Chesapeake to the Rio Grande. Alexandria, VA: Time-Life Books. ISBN 0-8094-4732-0; Fonvielle, Jr., Chris E. The Wilmington Campaign: Last Rays of Departing Hope. Campbell, California: Savas Publishing Company, 1997. ISBN 1-882810-09-0; Gragg, Rod. Confederate Goliath: The Battle of Fort Fisher. New York: HarperCollins Publishers, 1991. ISBN 978-0-06-016096-8; Kennedy, Frances H., ed., The Civil War Battlefield Guide, 2nd ed. New York: Houghton Mifflin Co., 1998. ISBN 0-395-74012-6.